It's time for another MFT Sketch Challenge. 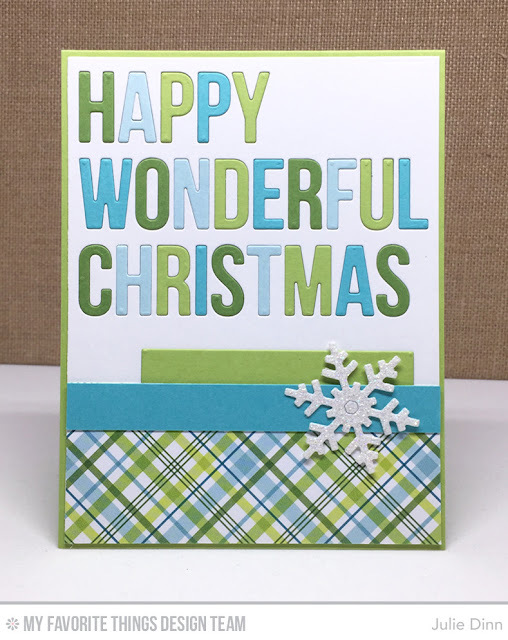 For this weeks sketch I grabbed the new Happy Wonderful Christmas Die-namics and a few colors of card stock. I chose colors that were in the Merry & Bright Patterned Paper Pack, Blu Raspberry, Gumdrop Green, Sour Apple, and Sno Cone. I finished off the card with a sparkly snowflake and a strip of Merry & Bright paper. Love the card AND I love, love, love your new hairstyle. Very flattering.